Massachusetts Governor Charlie Baker declared the week of November 13, 2017, “Massachusetts Apprentice Week,” in a proclamation presented at Interstate Electrical Services Corporation. 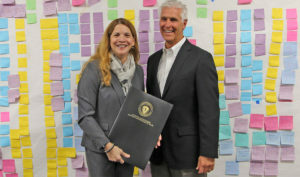 Massachusetts Secretary of Labor Rosalin Acosta presented the governor’s proclamation to Jim Alibrandi, president of Interstate Electrical Services, during visit to the company’s 100,000 square foot UL-approved Operations Center in Tewksbury Mass. Interstate’s Operation Center focuses extensively on pre-fabrication, a process that is more efficient and productive than assembling in the field. Detailers identify all boxes, conduits, fixtures and other parts that can be assembled in pre-fab. With controlled environmental and safety conditions, the Operations Center provides an optimal environment for apprentices to gain practical knowledge of lean construction and the company’s prefabrication and material deliver strategies.